American watchmaking isn’t a new concept. In 1854, as the Waterbury Clock Company, we took clocks from the mantels of the 1% and brought them to the world. Our roots in Waterbury, Connecticut—the Brass City—allowed us to evolve clockmaking, switching from wooden gears to gears made of brass. This, along with our modernized factories, allowed us to create longer lasting, more affordable timepieces. We didn’t stop there though. We’ve always been forward-thinking innovators. In 1901, produced the famous Dollar Pocket Watch that was so popular, writer Mark Twin bought two. Not too long after, we moved the pocket watch to the wrist. Originally issued as standard military equipment, wristwatches became the new civilian timepiece of choice after World War I came to an end. Throughout the years, we introduced character watches and the nearly-indestructible V-Conic movement. With the belief that “good enough” wasn’t good enough, our watchmakers continued to think outside of the box and we continued to evolve. 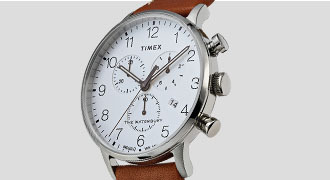 In the mid-century, we introduced the world to the Timex name and what would become our modern brand with the watch that “takes a licking and keeps on ticking.” Every week, America tuned in as John Cameron Swayze put our watches to the test on live television. 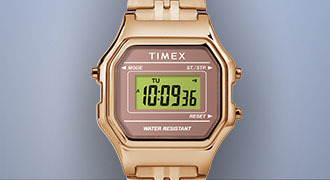 The slogan and our watches cemented Timex as a cultural icon. The industry continued to evolve and change, shifting towards quartz watch movement for a longer lasting, more accurate timepiece that was more affordable to produce. 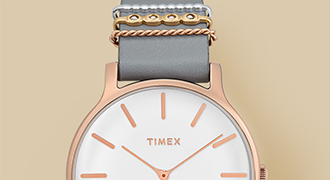 This transition to quartz movement brought production to Asia. And now, after decades, we brought watchmaking back home. Inspired by our people, culture and landscape, we set out to discover what it means to make a modern watch in America. Our watchmakers dusted off old tools and created new techniques to craft small batches of American-made watches at our headquarters in Connecticut—only seven miles away from our original factory. Just like our very first mantle clocks created 165 years ago, our American Documents collection layers American ingenuity and craftsmanship with European precision to create truly amazing timepieces. The collection currently features four striking American-made watches, drop forged in US-sourced stainless steel and hand finished to a brushed satin with a highly polished top ring. Impact-resistant Gorilla® Glass 3 protects the sub-second dial and gold-plated Swiss movement. The rich leather straps are made with American hides by American craftsmen. And right down to the details, the “Aged Waterbury Brass” case back coin and crown insert honor our original stamped brass clocks and our roots in Waterbury, Connecticut—the Brass City. 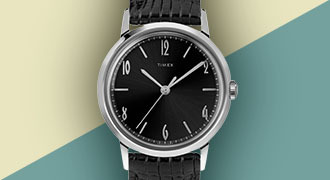 Creating an American-made Timex wasn’t easy. We invested nearly three years to find and qualify America’s best craftsmen, capable of creating the precision parts worthy of a Timex. We had to invent new processes for making hands and convince auto parts manufacturers they were capable of making something as beautiful as a watch case. We’re excited to bring watchmaking back to the US, and even more excited for you to join us on this journey.